Margaret Brammar (right) with daughter Cara Sanbell at the Warragul Farmers’ Market. Photos by author. There’s a lot more to apples than you see on supermarket shelves. How many varieties can you name? Three? Four? Margaret Brammar is a collector, and she grows over 400 varieties of apple. 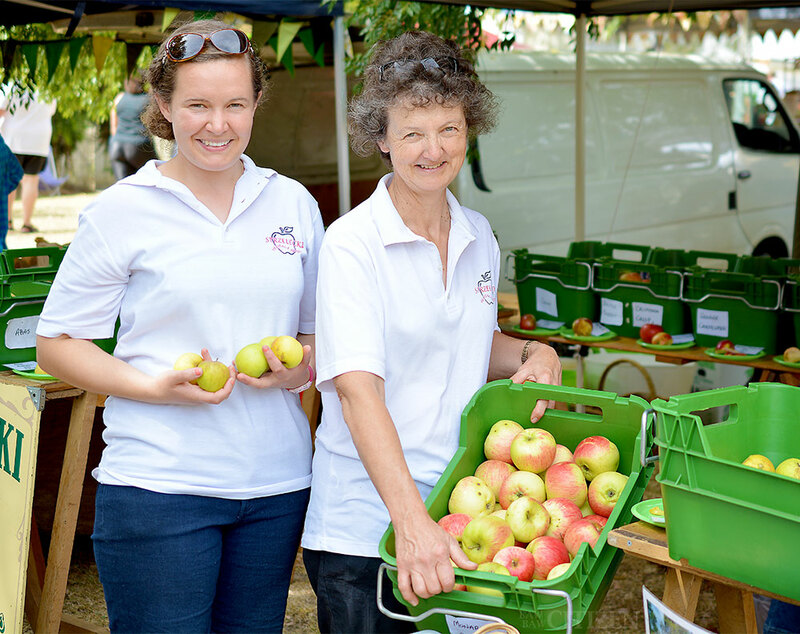 We caught up with Margaret Brammar, who runs Strzelecki Heritage Apples, at the Warragul Farmers Market to discuss the often-underestimated fruit. Apart from size and colour, how much variety is there in the flavours and uses of apples? There’s a huge variety of flavours and textures, from soft to really hard and crisp and crunchy, and variations in between. It’s really up to the individual, by tasting it, to decide whether they like it or not. McIntosh (Canada, eating and cooking) and Monarch Cross (England, eating) apples. Is there a favourite or is there a lot of variation in what people like? There’s certainly a lot of variation. Some people may have heard of the Snow Apple, which is one they often had as a child and which is a fairly mild-flavoured apple, but you can get others which have a more complex sugar and acid mix and, as an adult, they’ll probably really appreciate that combination more. Do you have a favourite apple for eating? No, not one favourite. Every week there’s something else that I find I really like, and the seasons kind of set the flavour of the apple. Some apples do better in a hot summer, while others are more suited to a cooler summer. You’re based in the Strzelecki Ranges, what do you find grows best? They all grow very well. Obviously different seasons will affect them in slightly different ways. Most apples will have quite a heavy crop, and the following year they’ll have a very light crop or even no apples. You can alter that by, in the heavy years, pulling them off the [tree] when they’re quite small to reduce the number the tree has. We don’t do that, we take them as they come. Akane (Japan, eating) and Ribston Pippin (England, eating) apples. What makes a good apple pie? Some really good ones are Belle de Boskoop, which is a dutch apple, and they are a dual purpose apple like your Granny Smiths, but they have a much more definite flavour. Another good one is Bramley’s Seedling; that’s actually a true cooking apple, so it’ll break down a bit more than most other apples. When you’re talking to people about apples, what’s something they’re often surprised by? The fact we have so many varieties, we have over 400. I start picking the first variety just after Christmas and the last variety I can be picking in July, sometimes into August. That’s a surprisingly long season between them all! It can be, but we’re slightly cooler up in the hills there, so the season might not be quite so long if you’re out on the flats or in a warmer area. What do you mean by russeted? It’s this brown [rough] skin. Often that’s the sign of a pretty good apple. A lot of people, if they saw that in a supermarket, would avoid it. That’s right, it’s not attractive to many people. Spartan (Canada, eating) and Blue Pearmain (USA, eating) apples. Would you describe yourself as an apple variety collector? What got you into this? Yes. We started off with 12 varieties and have grown up since then, but there’s various collectors around the country and slowly over the years we’ve built up the number of varieties. So grow, swap, share, and sell? Yeah, a bit of that, mostly just buying them off other collectors. Partly it’s just to keep the varieties around so they don’t disappear and to bring back a bit of the past. I was a bit interested in the history of the varieties. Margaret offers free tastings of many varieties of apple at her Warragul Farmers Market stall. This article was first published in the 23 March 2018 print edition of the Baw Baw Citizen.